NOAA Fisheries is pleased to present the 2017 Report to Congress on the Status of U.S. Fisheries managed under the science-based framework established by the Magnuson-Stevens Fishery Conservation and Management Act (MSA). The 2017 report highlights the work toward the goal of maximizing fishing opportunities while ensuring the sustainability of fisheries and fishing communities. 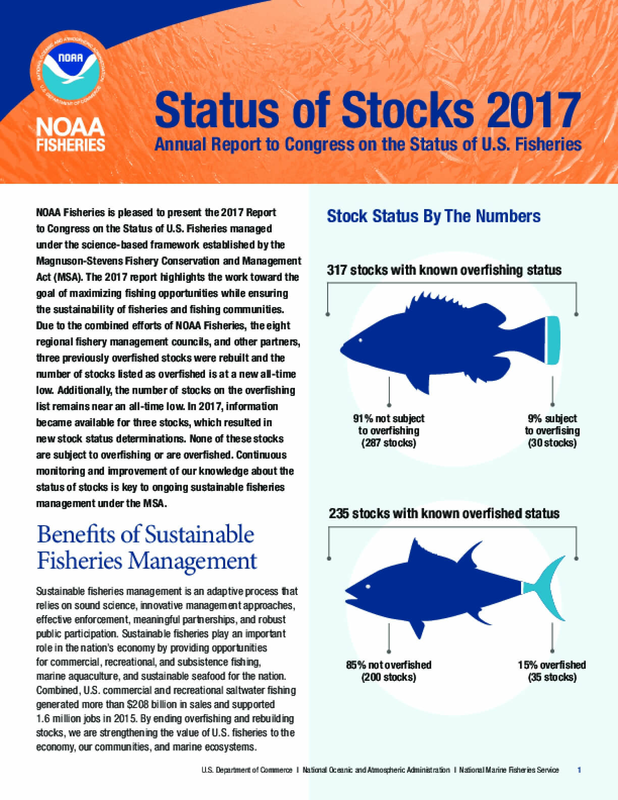 Due to the combined efforts of NOAA Fisheries, the eight regional fishery management councils, and other partners, three previously overfished stocks were rebuilt and the number of stocks listed as overfished is at a new all-time low. Additionally, the number of stocks on the overfishing list remains near an all-time low. In 2017, information became available for three stocks, which resulted in new stock status determinations. None of these stocks are subject to overfishing or are overfished. Continuous monitoring and improvement of our knowledge about the status of stocks is key to ongoing sustainable fisheries management under the MSA. Copyright 2018 by NOAA Fisheries. All rights reserved.